Alina Galushka --A Ukrainian by origin. An Appeal for Investors for these projects. Forbes annual results list are in...! New models from Gladrags Modelling Agency. Abu and Sandeep launched a new diffusion line on 29th April at their Bandra store. The due has been retailing from standalone store at Kemps Corner and their new flagship store comes a breath of fresh air. 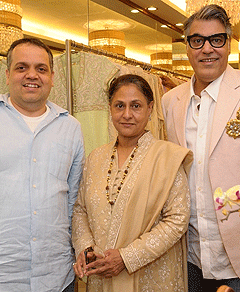 Fashinistars in Mumbai have again got an exotic collection by Abu Jani and Sandeep Khosla in the city. Some of the special clients visited the store at the launch. Jaya Bachanji visited the store to pick up few nice embroidered kurtas.